The April 5 issue of Rolling Stone features the deathbed confession of CIA operative and key Bay of Pigs/Watergate/Nixon administration figure E. Howard Hunt, The Last Confession of E. Howard Hunt by Erik Hedegaard. This piece is significant not only for its exploration of Hunt, but for breakthrough information that appears to thoroughly corroborate the work of key John F. Kennedy assassination researchers and historians. Lucien Sarti: Corsican assassin and drug trafficker, possible “French gunman,” Grassy Knoll (second) shooter. Would Hunt continue to tell lies on his deathbed? Perhaps. Would Hunt tell a final tall story or two, to protect himself, or perhaps deal one final slap in the face to the US government (which made him a fall guy for Watergate)? Yes. Would Hunt hide the involvement of certain individuals to whom he remained loyal, including people who are still alive? Certainly. Anything from an operative like Hunt can only be accepted with caution and healthy skepticism. Nevertheless, Hunt’s scenario has the ring of truth. Each of the named names are well-known CIA and CIA-linked players exposed by many researchers and historians who have detailed the enduring connection from the Bay of Pigs and the Dallas hit to Watergate and Iran-Contra. The Hunt confession vindicates generations of historians, researchers and whistleblowers who have given their lives and careers to expose the truth about Dealey Plaza. While there are too many to name, they include, but are not limited to (and in no particular order): Jim Garrison, Mark Lane, Fletcher Prouty, Josiah Thompson, Carl Oglesby, Peter Dale Scott, Anthony Summers, Robert Groden, Victor Marchetti, David Lifton, Harrison Livingstone, Michael Canfield, A.J. Weberman, Sylvia Meagher, William Turner, Jim Marrs, Pete Brewton, John Newman, Philip Melanson, Hal Verb, Mae Brussell, Harold Weisberg, Oliver Stone, Mike Ruppert and Dan Hopsicker, Jim diEugenio and Linda Pease. Meanwhile, the criminal deceptions of the US government and its corporate media, the Warren Commission, and the dirty work of cover-up specialists such as Gerald Posner and Mark Fuhrman, and the legions of JFK assassination revisionist/theorists, deserve a final rebuke, and eternal scorn. Although the Rolling Stone piece does not address it, the Hunt confession directly corroborates two classic investigations that previously exposed the role of Hunt. They are Mark Lane’s Plausible Denial and Michael Canfield/A.J. Weberman’s Coup D’Etat in America. 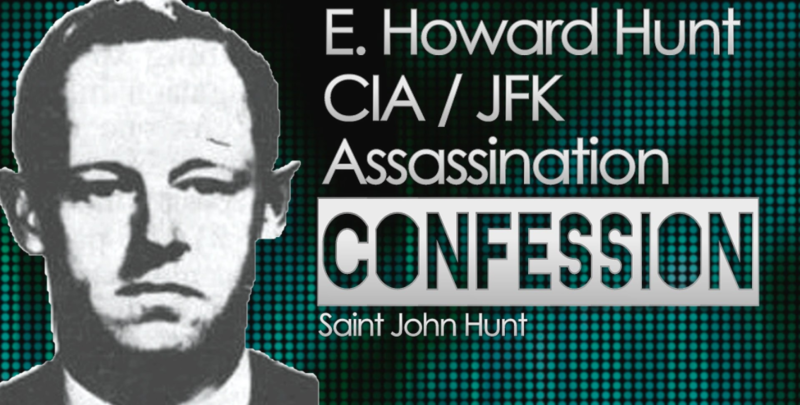 Lane’s book details how he took Hunt to court, and won a libel suit, essentially proving that the CIA murdered JFK, and that Hunt lied about his whereabouts. The investigation of Canfield and Weberman identified Hunt and Frank Sturgis as two of the three “tramps” arrested at Dealey Plaza. Time has only made these investigations more relevant. More than ever, their books, and those of the JFK historians and researchers above listed, deserve to be found, read and studied. The Rolling Stone piece fails to go after the roles of Richard Nixon and George Herbert Walker Bush. But the Hunt confession, if accurate, leads directly to them, to their lifelong associates, and all the way to the present George W. Bush administration. The Dallas-Watergate-Iran-Contra connection has been thoroughly documented by the key JFK researchers, and in particular, in the work of Peter Dale Scott, one of the very first to show the deep political continuity across three decades. Daniel Hopsicker’s Barry and the Boys goes into even more detail on the players. Consider the career of George H.W. Bush. He was a Texas oilman (Zapata Oil) and a CIA operative, involved with the Bay of Pigs. Bush’s name was found in the papers of George DeMohrenschildt, one of Lee Harvey Oswald’s CIA handlers. As documented by Pete Brewton, author of The Mafia, the CIA and George Bush, Bush was deeply connected with a small circle of Texas elites tied to the CIA and the Mafia, as well as the Florida-based CIA/anti-Casto Cuban exile/ Mafia milieu As Richard Nixon’s hand-picked Republican National Committee chairman, and later as CIA director, Bush constantly covered-up and stonewalled for his boss about Watergate, which itself (by the admission of Frank Sturgis and others) was a cover-up of the JFK assassination. Tracking any of the individual CIA operatives involved with the Bay of Pigs, it is impossible to ignore or deny direct connections to George H.W. Bush and his crime family, across the Kennedy assassinations, covert operations in Indochina and, later, Latin America. Beyond any reasonable doubt, the US government murdered John F. Kennedy. There are people still alive today who were involved directly and indirectly implicated. Some are probably even serving in positions of high influence. Some still have never been identified or touched. All of these individuals still need to be pursued, exposed, and brought to justice.